We are so excited to have this stunning gown in our new collection of dresses. Annette is a beautiful timeless gown, it mixes a beautiful deluxe satin bodice, which is really flattering, with a silk organza skirt giving the gown a gorgeous soft and yet luxurious feel. 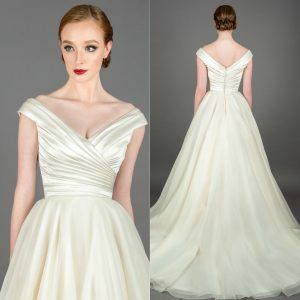 Keep your eyes out for all the new gowns we have coming in, there are lots more to come!